We left Kasulu on Thursday morning for our journey home. We are now in Dar es Salam, waiting for our flight to UK this afternoon. In western culture travelling tends to be regarded as something of a nuisance, and the quicker and more efficient the journey the better, with complaints about traffic and road works. In Tanzania journeys are not taken for granted, and people are aware of the difficulty and sometimes danger of travelling. Before we left home many people came to wish us well and to pray for us as we travel. They will be waiting for news from us that we have "arrived safely". We are of course privileged to be able to fly, as the usual way to get from Kasulu to Dar is the 36 hour bus trip. However we have a night in Mwanza and another in Dar, planned because the flights are unreliable and trying to travel quickly is somewhat risky. We stay in middle of the range hotels but often find it more fun (and a lot cheaper!) to get meals out on the local streets. Chips mayai are a great fast-food option here and there are lots of stalls along the side of the road delighted to take an order. It takes about 2 minutes to be ready : take chips cooked beforehand, toss into a frying pan over a charcoal fire, add 2 eggs and some chopped vegetables and seasoning, skilfully flip it over ..... and when ready put into a plastic bag for take away : (or sit on a plastic chair on the side of the road for "eat in"). 60p for a good meal for 2. 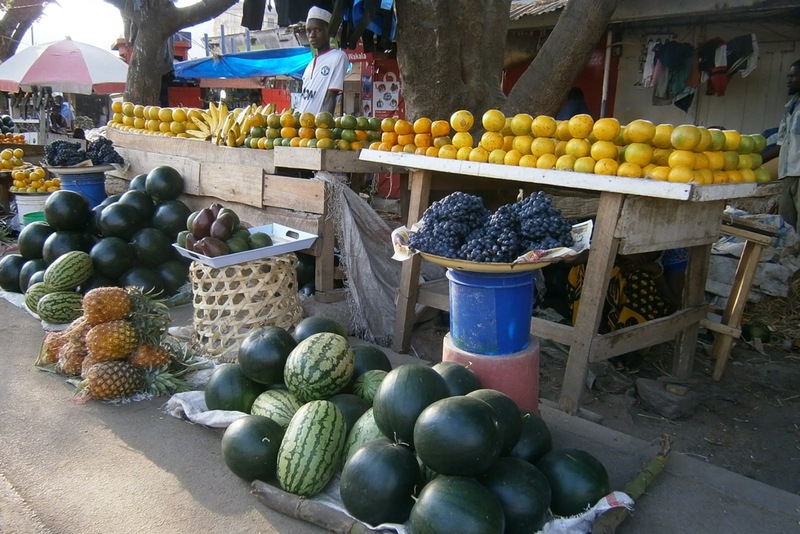 Another 40p will buy a collection of wonderful fruit from the other side of the road - both these pictures were taken where I bought lunch in Mwanza yesterday. We're thankful for a long-ish journey home which gives us time to rest, reflect and readjust. We both read a lot and are inseparable from our Kindles. I'm also using the time trying to read 1 Corinthians in Swahili - it's difficult enough to understand in English! Thank you for all who have sent us good wishes for our journey, and we are very excited to be on our way home!